La Petite Colombe – NEWish – this is the sister restaurant to the famous La Colombe Restaurant. It promises a talented team of chefs offering fine dining tasting menus. La Petite Colombe has taken the space at Le Quartier Franscais that was home to legendary chef Margot Janse for many years. Expensive – but talented Chefs – so worth the investment if you are here and holidaying on US dollars or pounds! For locals – perhaps wait for the winter specials! This is highly recommended for any foodie to experience while staying in the village! Le Coin Francais – by talented Chef Darren Badenhorst -on the main drag in Franschhoek. I popped in to have a look – gorgeous decor – it simply feels grand as you walk in, with wonderful attention to detail and decor. They are currently open for dinner – choice between a 6 or 8 course tasting menu which can be done with our without wine pairing. This looks really good! From their website – The newest edition to the Franschhoek scene is a restaurant really and truly for Franschhoek. Both in concept and in name, the aptly named “Le coin Français” , which literally means Franschhoek, will embody the essence of the valley in heritage, cuisine, art and wine. It will feature cutting edge methods meeting time tested French elegance in cuisine, a carefully selected locally themed wine list to showcase the best local wines, a French sommeliers selection, and an ever evolving collaboration of art in the theme of photography. 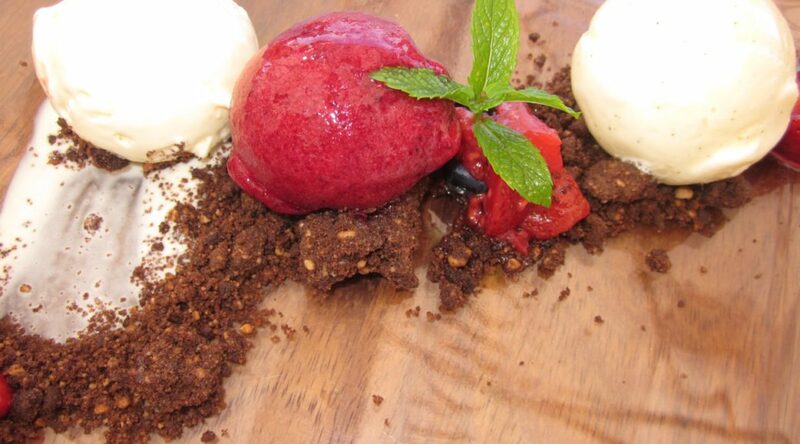 Foliage – is home to the talented and passionate Chef Chris Erasmus. He is like a mad professor having endless fun! Behind him in the kitchen are endless jars……….what is he up to?? He is foraging in the mountains and drying his own ingredients – hence all the jars! The menu is small and changes all the time dependent on what he has found while foraging and what is seasonal. It is a small menu – so perhaps don’t take fussy friends – simply take adventurous souls. The decor is lovely and intimate and the new restaurant is located across the road from Le Quartier Franscais on the main road through Franschhoek. I highly recommend Foliage for a dinner if you are staying in Franschhoek. Make sure you go and chat to Chris and his team in the kitchen. They are inspirational and their passion is infectious! Marigold – NEWish – awesome addition to Franschhoek!! Great to have Chef Vanie Padayachee back in the Franschhoek Valley to launch Marigold a North Indian Cuisine restaurant owned by Mr Singh of the Leeu Collection. If you are a fan of Indian cuisine – this will be one of the best you have tried. Wonderful contemporary decor and located in the heart of the Franschhoek village. Pierneef at La Motte – A visit to the La Motte wine estate is wonderful experience. The estate is owned by Hanneli Rupert. The Rupert family are one of the most wealthy families in South Africa and have always had a love affair with art. Here you can visit the art gallery and view some local art which includes a fairly large collection of one of our most famous artists – Pierneef. The estate also boasts great sauvignon blanc (one of which is organic) and shiraz. In the tasting room you are welcome to walk around the barrel maturation cellar and enjoy a very civilized wine tasting. The staff are extremely professional in the tasting room and focus on elegant presentation in a beautifully appointed room. I love the lovely touch of bringing the glasses on a silver tray with either a ciabatta bread roll or crackers to clear the palate between tasting. Located between the gallery and the tasting room is the beautiful Pierneef restaurant. If you are a slightly larger group – make sure you try and secure one of the rustic wood tables under the oaks – if you get it, you will not want to move for the rest of the day. Chef Eric Bulpitt has moved from Faber to La Motte. 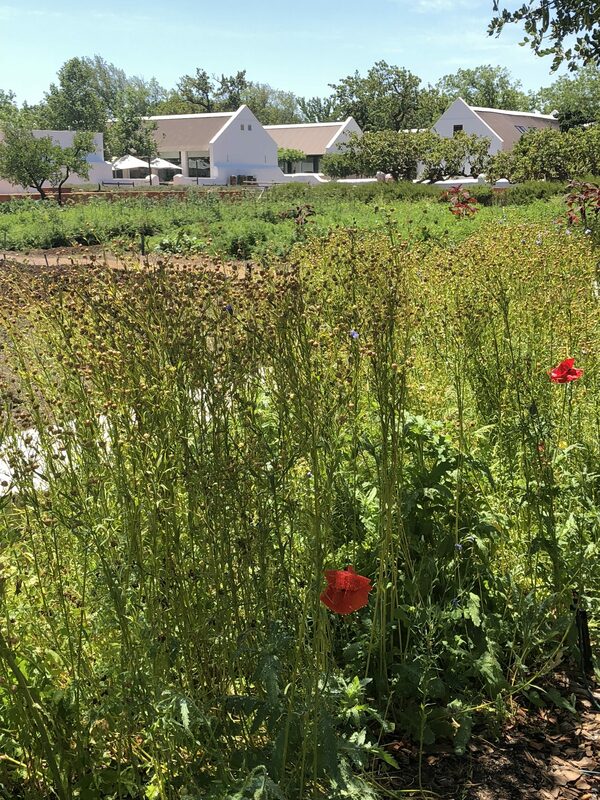 I am sure he will continue the legacy of including traditional flavours and of local sourcing – Chef Chris left an amazing vegetable garden behind when he left La Motte to open Foliage! 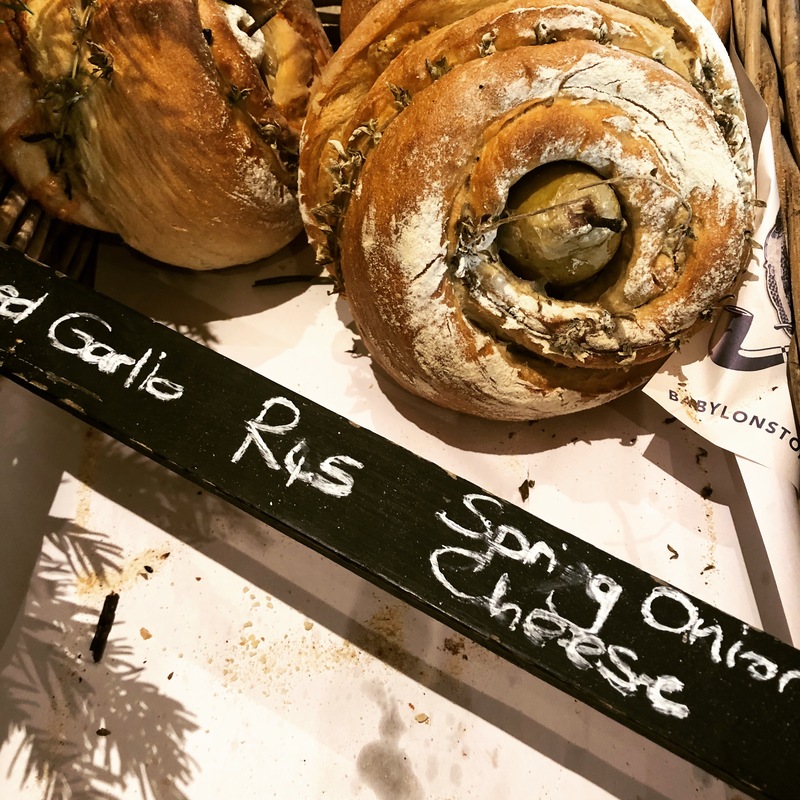 Note that La Motte also has a deli/shop that is well worth popping into – it has everything from barrel wood chopping boards to the most delicious looking mini cakes such as lemon meringue and cheese cakes. Chefs Warehouse at Maison Estate – replaced the Kitchen at Maison Estate on 1 December 2017. The head chef from the Kitchen at Maison – Chef Arno Janse – moved on to open his own spot called Janse & Co in Cape Town. The extremely talented Chef David Schneider (ex Singita, Chefs Warehouse CT, Chefs Warehouse Beau Constantia) has been given creative license within the Chefs Warehouse Formula of 8 dishes per day. Note that the concept is 8 gourmet tapas style dishes for two people to share – no selection – you get what the kitchen is inspired to prepare. They can handle vegetarians – but need advance warning! Note that this Chefs Warehouse DOES take bookings. I would recommend you book in advance for this one. IMPORTANT TO NOTE – they are kid friendly – kids can have pizza or grilled fish & veg. Note that the lunch is geared towards you staying for a lovely long and relaxed lunch – it is NOT rushed – so make sure you put time aside to relax and enjoy it. Reubens in Franschhoek – relaxed fine dining with innovative combinations, good size portions and something on the menu that will appeal to most tastes. Reuben worked at a number of restaurants in this town working his way up in the kitchens, before departing for a stint overseas. The town people lured him back and he opened his first restaurant to much acclaim. In summer dine in the outside courtyard and plan to stay for three delicious courses. Reuben recently bought his own property in Franschhoek and as such has re-opened in one of the side streets off the main drag in Franschhoek. The restaurant is looking really lovely! 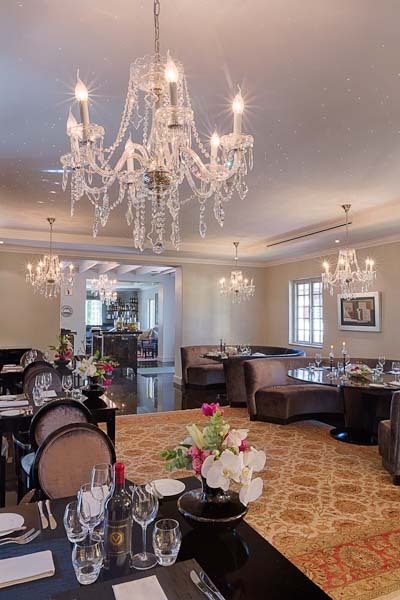 Grande Provence – To me, this is one of the most beautiful restaurant in the winelands. The decor is elegant and modern. If dining there in the evening – dress up a little and turn the night into a special occasion. Chefs seem to turn over every couple of years here and this year is no exception – executive chef Darren Badenhorst – has left to open his own restaurant in Franschhoek called Le Coin Francais. The new Chef comes with good credentials and has worked for many of our top Chef’s – Guy Bennett – I will have to return to see what he is doing! Grande Provence is also home to a wonderful contemporary art gallery that promotes South African and African artists – it is well worth a browse around while you are there. Open daily for lunch & dinner. Closed on Sunday nights during winter. 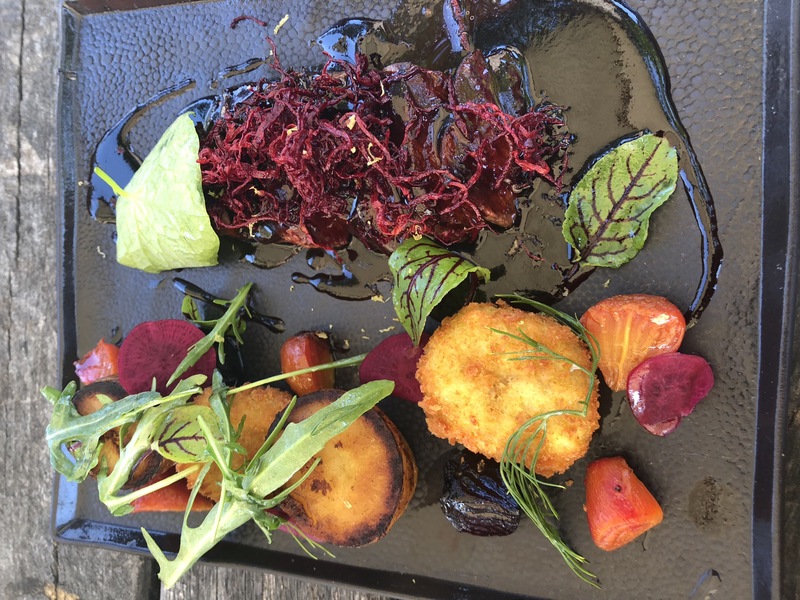 Bread & Wine on Moreson Wine Estate- is a relaxed venue on a wine farm near Franschhoek offering interesting innovative dishes at reasonable prices. 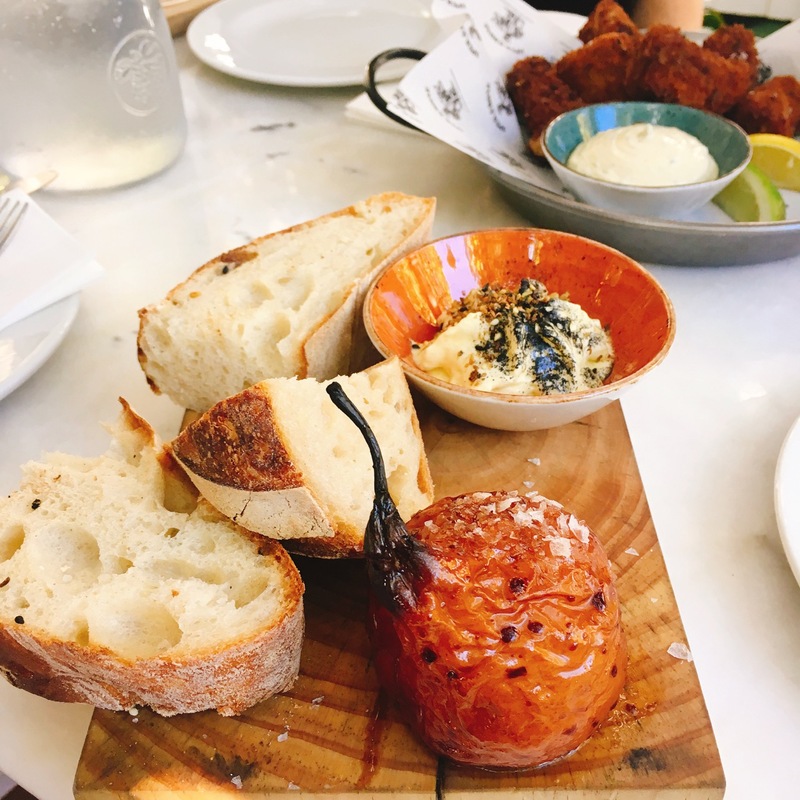 Spend the entire afternoon on the outside terrace enjoying their feta stuffed bread with rocket or pap gnocchi or caramelised corn biltong accompanied by chilled Franschhoek wine. The aim is to produce simple food with heaps of flavour. They bake their own bread daily and chef Neil Jewell has his own Charcuterie on the estate. The meats are also available for sale from their deli. He is the inspiration behind the seasonally influenced and locally inspired menu. Moreson Wine Farm Franschhoek. Open daily for lunch. +27 21-876-3692 . Note that they also offer cooking classes on bread making and charcuterie on specific dates – so check out their website for the dates. 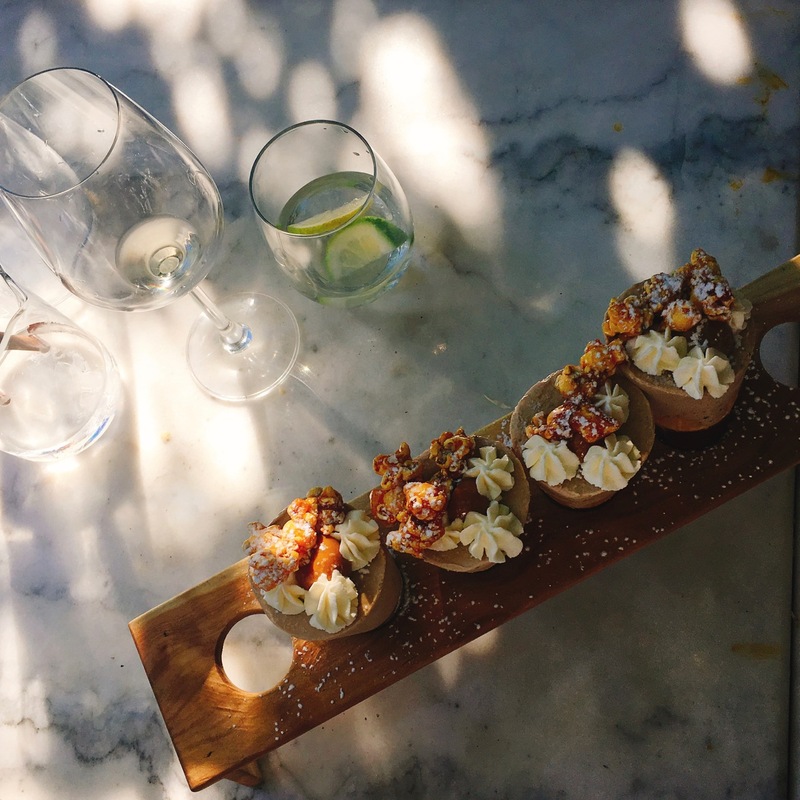 For years, Franschhoek was the main gourmet hub in the winelands. Stellenbosch is now giving it a good run for its money and now has many award-winning restaurants. Spek & Bone – this is one of my favourite summer restaruants! I am in LOVE with Spek & Bone. This is the new chilled offspring from the renowned local Chef Bertus Basson. 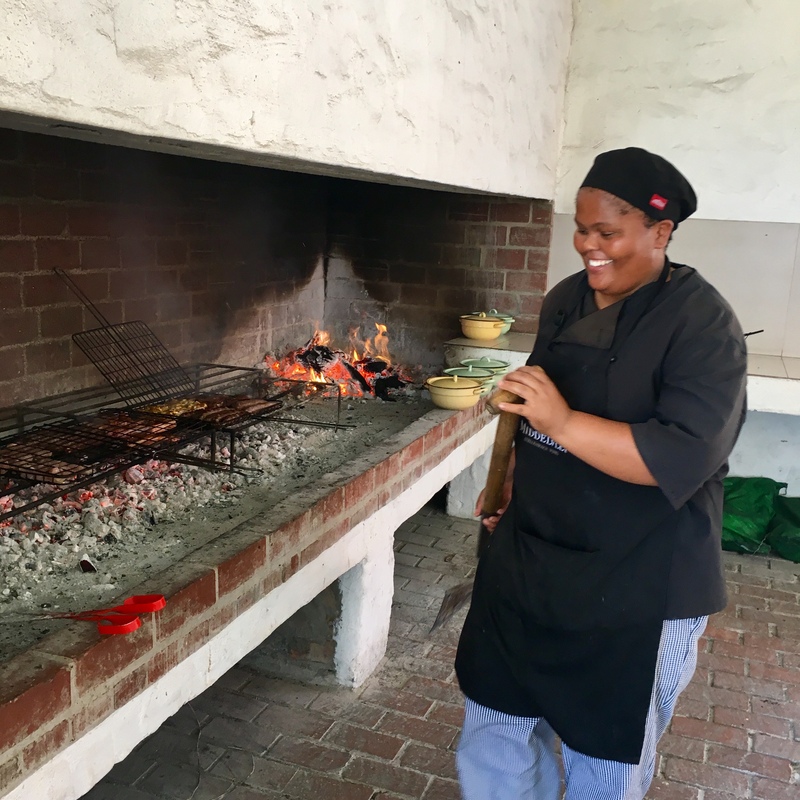 It is a simple concept – take a lovely hidden courtyard in the oldest part of Stellenbosch Town and create a chilled wine bar with delicious shared plate dishes…….that are created by Bertus Basson and his talented team of Chefs. This is the perfect spot for a long afternoon with friends. Note closed on a Sunday. Otherwise open for lunch and dinner. Tip – don’t miss the peppermint crisp ice cream cone at the end – for any South African it brings back happy childhood memories. 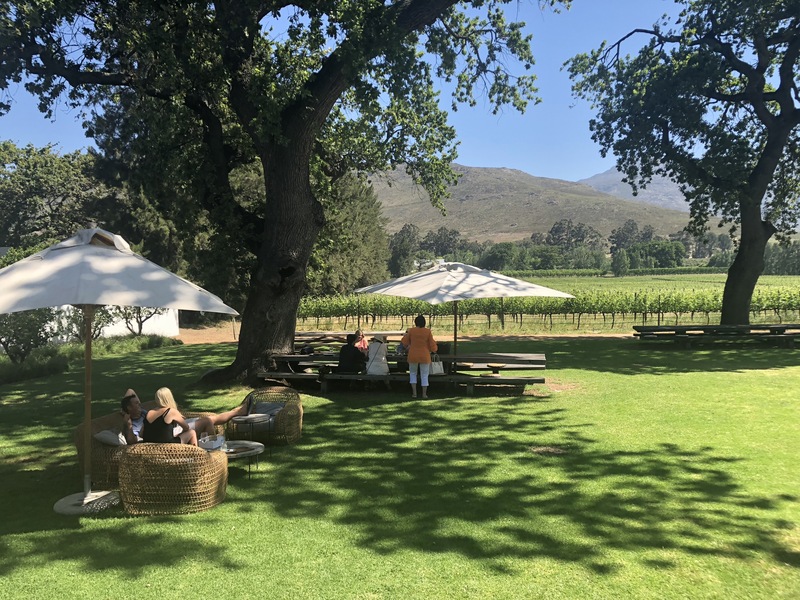 Delaire Graaf Restaurant (on Delaire Graaf wine estate – Hellshoogte Mountain pass Stellenbosch) – I watched them build the new drive way into this estate for a year and a half and must admit I was very curious to go and check out what the end result was. The Graaf family are diamond dealers and the budget for the revamp of Delaire was extremely high. The end result is quite simply gob smacking. This estate always boasted one of the best views of the wine region. Take the stupendous view and add innovative modern architecture, a cellar enclosed in glass for the public to view, a refined tasting room, a glamorous restaurant with plenty of outdoor seating and a high calibre local art collection with sculptures dotted around the garden – you have a winery that is now a destination that must be included on a visit to the wine region. The restaurant is not cheap – however – the setting (panoramic mountain views) and the décor are unbeatable! Over the years the chefs have changed quite a few times – they have however managed to keep up the food standards and the food here is usually great! This is the perfect spot to spend an afternoon. You feel like you are royalty and living the good life by simply spending an afternoon here. Tel: +27-21- 8858181 or info@delaire.co.za Note that I would highly recommend booking fairly well in advance. Open for lunch & dinner daily. Tip – book for an early table 12h30 or you don’t get a table with a great view! Tip 2 – Delaire has a second restaurant called Indochine which is located in the main hotel – it offers dishes with an Asian inspiration and the same fantastic view from their terrace. This is a great back up plan if you experience any difficulty getting into the main restaurant – or have done the main restaurant on a previous trip. The space is smaller and more intimate then the big main restaurant. Update: One can now only book 6 months in advance for lunch for the Delaire Restaurants. Rust en Vrede Restaurant – is located on the multi award winning Rust en Vrede estate. The estate is best known for its red blend which has been listed by US Wine Spectator magazine as one of the top 100 wines in the world for many years. The restaurant has coverted the old wine cellar to create a beautiful space for a fine dining restaurant. Note that this restaurant is only open at night – which means – it is best to experience it if you are staying over in the Stellenbosch region. There is huge attention to detail – they had plates made specially for their dishes, only use Riedel glasses and even have Laguiole knives to make the experience unforgettable! The chef is John Shuttleworth who took over as head chef in 2011, his wife Andrea is running the front of house (both have worked at Michelin starred restaurants abroad) and the Sommelier Joakim Blackadder (one cannot help but smile at the surname!). Together they craft a memorable food and wine journey. There is the choice of a 4 course a la carte menu or a 6 course wine and food pairing menu. In summer you would need to book well in advance as this restaurant has been listed as one of our top restaurnts in the country since opening. Open Tues – Sat for dinner only. Tel no: +27 21 881 375 Cost $$$$ Note that they have a lighter option on the estate for lunch – you can either have a steak or a piece of salmon – this is in the winery section and is a separate offering from the main restaurant which is only open at night. Jardine Restaurant in central Stellenbosch Town – NEW – this is a really exciting new opening as Stellenbosch town has lots of fun and funky relaxed places for dinner – but very little fine dining in the town itself. Chef George Jardine is one of South Africa’s top chefs and originally had a Jardine Restaurant where foodies made endless pilgrimages to in Cape Town. He then moved to Stellenbosch and opened the Restaurant @ Jordan. This promises to be a great fine dining experience. It seems well priced too! Open Wednesday to Saturday for lunch and dinner. Click here for booking details. 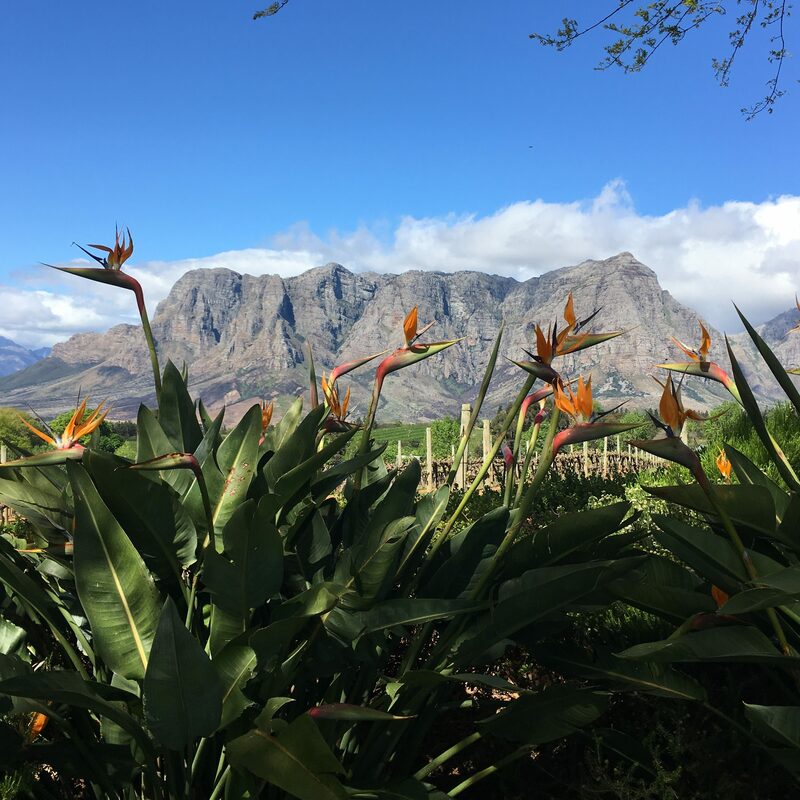 Delaire Graaf (on Delaire Graaf wine estate – Hellshoogte Mountain pass Stellenbosch) – I watched them build the new drive way into this estate for a year and a half and must admit I was very curious to go and check out what the end result was. The Graaf family are diamond dealers and the budget for the revamp of Delaire was extremely high. The end result is quite simply gob smacking. This estate always boasted one of the best views of the wine region. Take the stupendous view and add innovative modern architecture, a cellar enclosed in glass for the public to view, a refined tasting room, a glamorous restaurant with plenty of outdoor seating and a high calibre local art collection with sculptures dotted around the garden – you have a winery that is now a destination that must be included on a visit to the wine region. The setting (panoramic mountain views) and the décor are unbeatable! This is the perfect spot to spend an afternoon. It is gob smacking in terms of the views and the restaurant is absolutely gorgeous. The current chef at Delaire is rocking my world (Michael Deg) – there is a great emphasis on freshness (he has his own veggie patch to harvest from) and the dishes are more simple, the flavours fantastic and his plating is quite simply beautiful. You feel like you are royalty and living the good life by simply spending an afternoon here. I would highly recommend booking in advance. Open for lunch & dinner daily. Tip – book for an early table or you don’t get a table with a great view! Update: One can only book 6 months in advance for lunch! Table at De Meye Wine Estate – this is an absolute favourite of ours for weekend lunches with a group of friends! They are only open for lunch Thursday to Sunday. In summer you sit under the trees all afternoon – in winter you sit in the cozy farmhouse. This is like going to someones home for a long Sunday lunch. 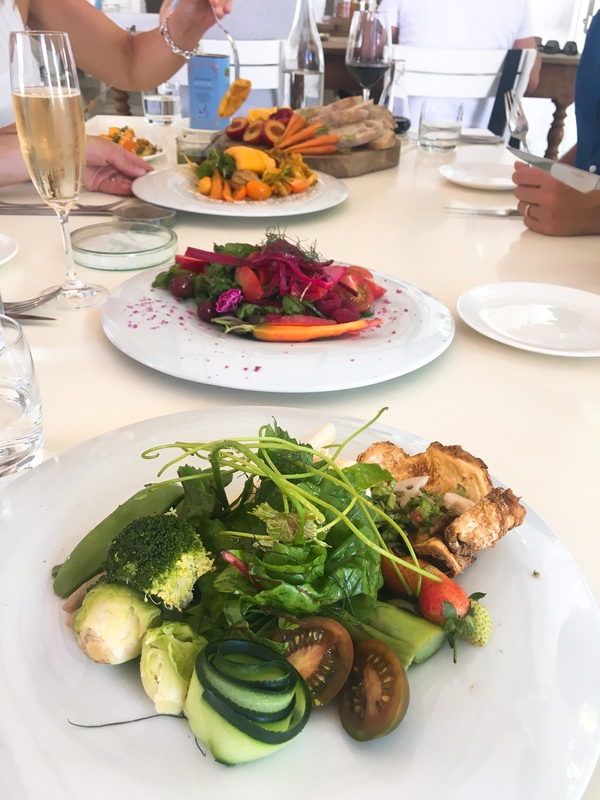 There is no choice on the menu – starters are brought to share, mains are served in big bowls to serve yourself like you would at home – eg a salad, roast veg and a roast chicken. All ingredients are sourced from farms around them and every ingredient has a story. They also have their own vegetable garden that they harvest for the weekend. They do cater for dietary requirements – but they must be mentioned on booking! This is a foodie journey at every step – and each mouthful is a flavour journey. I would highly recommend a visit! Cuvee on Simonsig Wine Estate – This is a delightful addition to the Stellenbosch region – gorgeous décor and fine dining. The restaurant offers all courses as either a starter size portion or a full size portion and offers a wine pairing with each. My recommendation is to order the starter size portions – this way you can sample more of their delicious dishes. Additionally, although the décor is beautiful inside, the view of the vines surrounding the restaurant is restricted – so either book for a table next to a window with a view or for an outside table. I thoroughly enjoyed my lunch and would recommend a trip to Simonsig. Tip: Simonsig was one of the first estates to make champagne in South Africa and as such it is definitely worth doing a wine tasting while you are there, and ordering a few bottles of champagne to take home. We fell in love with the Simonsig Brut Rose. Location: Simonsig Wine estate, Kromme Rhee Rd, Stellenbosch wine region. Closed on Mondays. Open for lunch Tues – Sun. Open for dinner Friday nights. Tel +27 21 888 4932. Tokara –is the domain of Chef Richard Carstens. Carstens has for some years followed the El Buli style of deconstruction cooking. 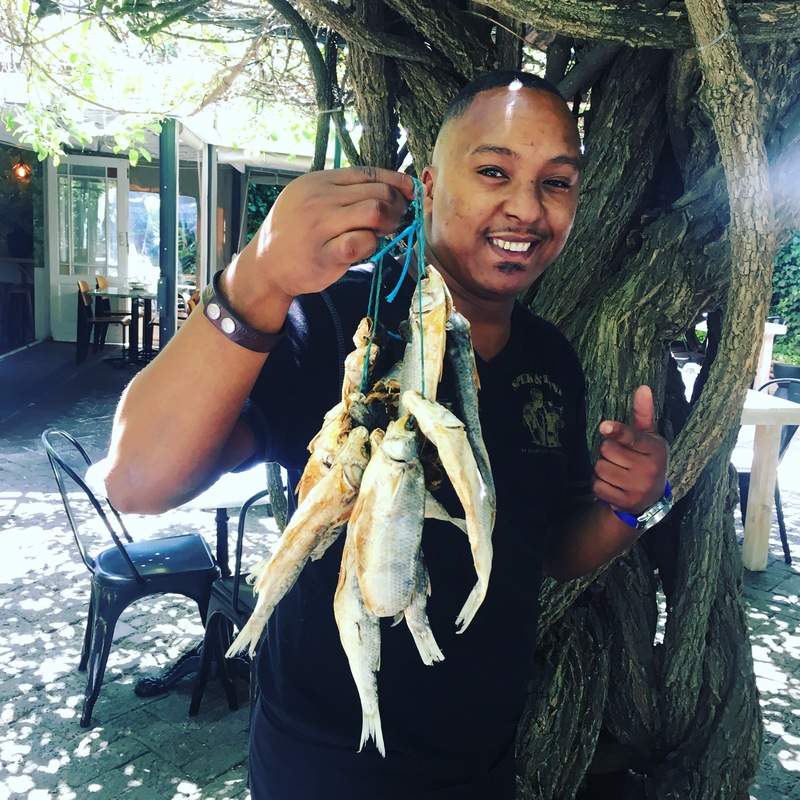 In his former career he headed up the kitchen of Lynton Hall in Natal, next, he teamed up with the guys at Monolo and then launched his own restaurant in Cape Town. There is no doubt that he is an excellent chef. Tokara restaurant boasts one of the loveliest views of Stellenbosch from its terrace, as such to get the best enjoyment out of the visit, it is recommended that you book on the outside terrace. The restaurant is relaxed, there is no need to dress up to visit. Note that the service is formal and that the food is fine dining at its most complicated. For the average person, you would need to have extensive foodie knowledge to understand the menu! Despite the challenge and lack of any idea of what is coming once you have ordered – the food is extremely good and the dishes highly creative. Address: Tokara Estate, Hellshoogte Pass, Stellenbosch For reservations, call +27 21 885 2550 or email reservations@tokara.com Open Tues – Sat for lunch & dinner. 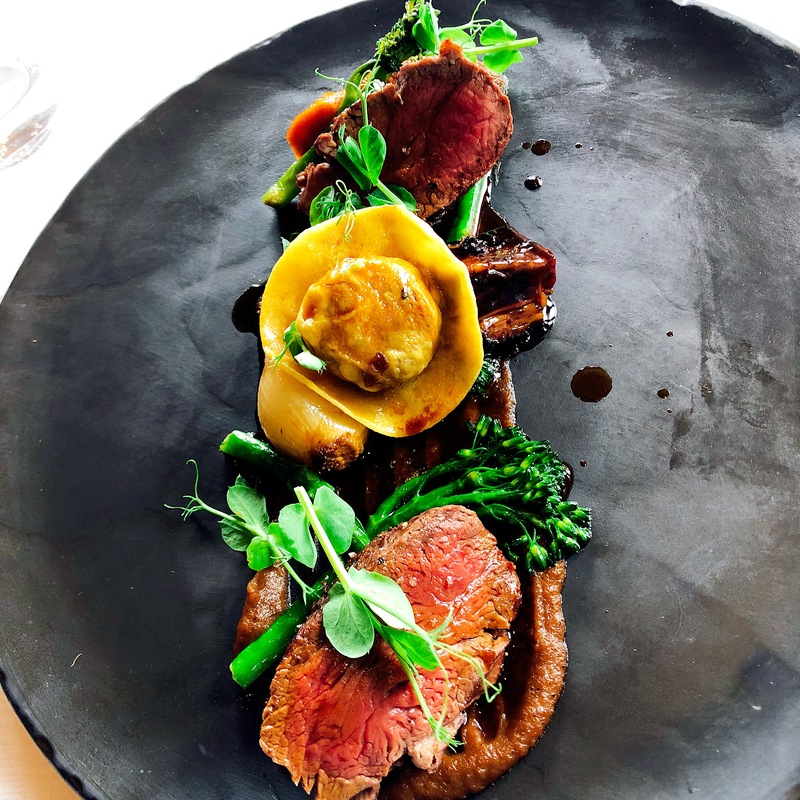 Tokara DeliCATessen – Tokara have two restaurant options – the fine dining restaurant located in the same building as the winery and tasting room and DeliCATessen next door. One can simply park at the main restaurant and do a walk through the olives and art to get to the deli side. This is a wonderful space to visit if you want a lighter lunch, if you have kids traveling with you or if you are an art lover. It is located in its own contemporary building and has a variety of sculptures on display in the garden (which are all for sale – so they swop around a lot!). This is a deli where you can taste the estates oils and stock up on everything from parma ham to chocolate to take home with you. The menu offers a delicious assortment of lighter dishes that are all delicious – simple with a gourmet twist of fabulous flavours. The garden area has fantastic creative items in for the kids to play – a birds nest to climb in – a wonderful funky wooden jungle gym for climbing and many toys that can be taken inside or outside. However during the week one sees few kids there – it is a tranquil space and one I spend a lot of time at! It is very well priced and offers great value for money. 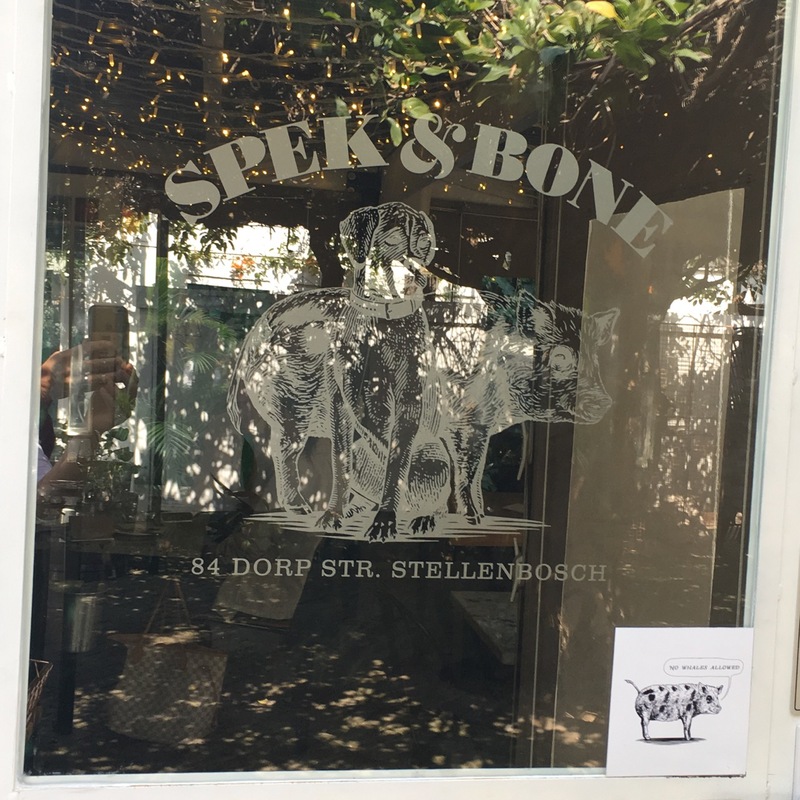 Spek & Bone – NEW – Not to be missed by foodies!!! Fabulous small spot. Relaxed. Vibey. Great Chefs. Wine bar with small plates of food for sharing. Every dish is a taste sensation! Order as many small dishes as you can for a proper experience. This is the new baby of Chef Bertus Basson of Overture. They have an amazing wine list – this is an absolute treat for me as a local wine fanatic as there are so many wines on the list that I have not only not tried – but not even heard of! There is a talented team of creative chefs in the kitchen. Note this is not a fine dining spot – it is simply the perfect place to head to with a group or friends to spend a fun afternoon or evening. Do not miss the peppermint crisp ice cream cones at the end of the visit. This is my new favourite soul home in the town of Stellenbosch. I would highly recommend a visit. Note – it is hidden behind Oom Samie se Winkel on Dorp Street in Stellenbosch Town. Brampton Wine Studio – A wonderful concept of having a wine bar to showcase your own wines – accompanied by light eating options. We loved the vibe here and the lovely friendly staff. Admittedly we only drank wine – so I cannot comment on the food! Bartinney Wine & Champagne Bar – this is more of a spot to have a drink and to enjoy the beautiful setting! I love the old vines that they have used as part of the decor. The bar showcases the Bartinney Estates wines – which are fabulous! Make sure you do not miss having a glass of chardonnay – it is my favourite chardonnay from the region. We tried the cheese plate – which was tiny pieces of cheese! If you nibble – head elsewhere for dinner. They closer really early – I think 7pm – so start the evening here! It is just off Church Street. Entrance Bird Street. The Big Easy – This is owned by Ernie Els the famous South African golfer and the Rupert family, one of South Africa’s wealthiest family. It showcases both the Ernie Els and Rupert family wines. This is one street up from Church Street and is located in the beautiful historical Cape Dutch style homestead called La Gratitude in Dorp Street. I have only had the burger here – and it was fabulous! De Stomme Jonge – quirky little bar with some delicious eats. This is a fun spot to pop into for a drink and to people watch. It is frequented by lots of friendly locals! 3 Ryneveld Street – just off Church Street. 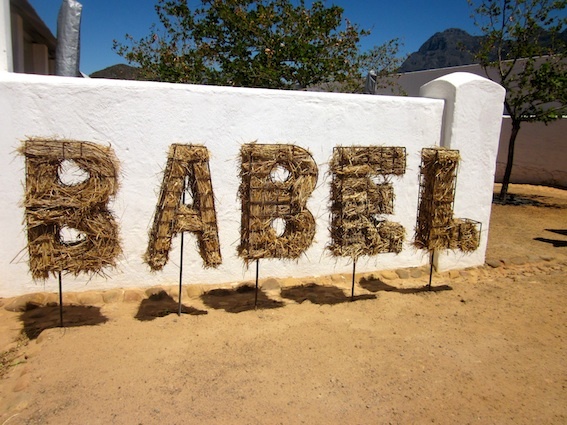 Babel on Babylonstoren Estate– this is still one of my absolute favourite resaurants in the Cape Winelands. Their emphasis is on freshness – they harvest from their own organ ic garden a few hours before lunch – fabulous! Babylonstoren is a new wine estate and boasts fantastic 5* farm style accommodation which is both rustic and modern and perfectly suited to those who are foodies! They have been cultivating their organic garden for the last four years and it now boasts over 300 types of vegetables, herbs and fruit. Note you can also book to do the Garden Tour with the Botanist (highly recommended!). For lunch at Babel, I would highly recommend you start by ordering the freshly harvested salads – I love the theme of Red, Yellow and Green salads – as a foodie you need to order all 3 when you go!! The main course is simply done – you chose your protein – fish/meat/veg and they then bring a wonderful bowl of veg and roast potatoes to the table. The restaurant is an exercise in simplicity – little is done to distract from the freshness of the ingredients. Book for this immediately if you are going to be anywhere in the area – during season it is very difficult to get a booking – especially on weekends. They accept a limited number of bookings on their website in advance. The other alternative is to wait for the bookings to open two months before your date that you are looking to book. Note that they have now opened a 2nd little restaurant on the estate called The Greenhouse. This one is for those who want to just come for a coffee or tea or light meal in the garden. It offers a choice of different sandwiches on home baked bread in their coal oven, as well as cakes and sweet things. It is delightful and well worth combining with a booking for the organic garden tour with the botanist at 10am. The Greenhouse does not take bookings and is on a first come first served basis. Open Wed – Sun for lunch and now daily for dinner. To book Babel or the garden tour, email enquiries@babylonstoren.com Or call them on +27 (0) 21 863 3852. For more information on Babylonstoren and Babel Restaurant check out my blog on Babel Note this spot is now very popular – Bookings open TWO MONTHS in advance. Now one has to diarize the date to send the email to book the Babel restaurant – and if you are a day or two late on booking – you are unlikely to get in – even in winter! Note it is easier to get in for dinner then for lunch. Bertus Basson at Spice Route – has closed down. setting and perfect if you have rugrats as the play area is right there. The chef does innovative light meals with an emphasis on freshly sourced ingredients – this may be the cheapie restaurant on the estate – but the decor is gorgeous! The second restaurant is called Camphors. It is named after the historical camphor trees on the estate that date back to the early 1700’s. The decor is beautiful – so it works for sitting inside in winter and outside during the summer. The cuisine is fine dining. The chef PJ Vardis has now moved on – and the website is not giving any clues as to who is heading up the restaurant now……….I will have to do more research and update this page soon! The Restaurant at Waterkloof – recently voted as our top restaurant in the country! New – Seven by George Jardine has opened in Somerset West.